HOFS was packed out for November’s free slide show from Hadleigh & Thundersley Community Archive. Our apologies to those who were turned away. 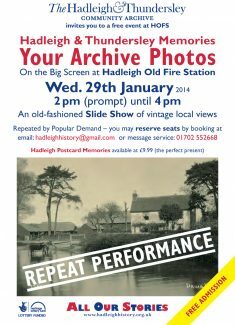 Patrons who have not yet done so are respectfully invited to reserve their seats now for Wednesday 29th January 2014 at HOFS from 2 pm to 4 pm where you can participate to identify people, places and events in pictures from times past. Reservations by e-mail to hadleighhistory@gmail.com or use the message service at 01702 552668. Once again, admission is free and modest refreshments will be provided; for which retiring financial contributions would be appreciated. “Thundersley and Daws Heath in History” by Robert Hallmann. visit a “drop-in” to meet an editor so we can advise you further. All articles are reviewed by editors before publishing.